The opening night film for New Directors New Films is a horror film from Iran. 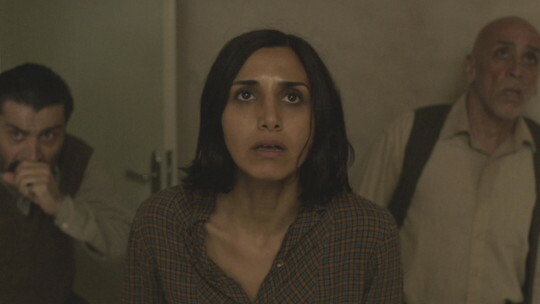 UNDER THE SHADOW garnered good word of mouth earlier in the year and seemed to poised to be another GIRL WALKS HOME ALONE and continue the recent trend of horror films opening NDNF. Sadly the film is not up to the earlier films and leaves you wondering not so much why the film the was picked for the festival, rather why it was picked as the opening film. Set during the Iran Iraq was of 1980 to 1988 the film concerns a mother and her daughter living in Tehran. As the film opens a perfect storm of negative activity is hitting- her ability to go back to school is stopped because of her youthful political activity, her husband has been called up and Iraq is sending missiles to attack the cities of Iran. As things become complicated her daughter is suddenly afraid of djinns, the result of what she was told by a weird little boy sent to live with his relatives. Things escalate as the young girl begins seeing weird figures and bombs begin dropping. This is a good little horror film that is trying to be about more than just the scares. Set in a world where going outside without a head wrap would get a woman beaten and thrown in jail (something threatened to our heroine when she runs in terror into the street) the film is very much interested in exploring the politics of life in Iran during the period of the war. As political film it’s an interesting look at a society that was demonized in America for decades. It’s great to see that despite all the restrictions the people really weren’t monsters (not that I ever thought they were). As a horror film it’s a mixed bag. Taking a leisurely pace before things really getting going the film never really generates enough tension to sustain the chills. Worse the horror follows typical horror patterns and if you know your horror you’ll know what happens…. That said the film generates two great scares and a third really good one that will literally have you tingling. Seriously after one cheap jump scare with a loud noise there are two others that freaked me out despite knowing that something was going to happen. A third had me muttering that was just wrong (in a good way). The problem is that despite the great scares the film isn’t all that scary. As I said you can guess where this is going. And then of course the whole notion of Djinn are rather alien to Western audiences who don’t really know what they are. The closest things most know are the Genie in ALADDIN. It’s not the same thing, and it hurts the film because we don’t know what we are supposed to be afraid of. Worse the film doesn’t end, it stops leaving the door wide open for a sequel. This is an okay horror film, but what the hell is it doing as the opening film of New Directors is completely beyond me. I mean after getting it right the last two years with BABADOOK and GIRL WALKS HOME this is a huge let down.